The building frame for the float was cut out and assembled. We used MDF which was not our first choice. Supplies of plywood are very limited where we live so you take what you can get. Temporary bulkheads set up on the strong back. We used a steel channel section between the sides of the strong back. This ensures straightness but also made the sides quite close together. This is the reason for the props on the sides of the temporary bulkheads. Attaching the panels. We removed the peel ply from the pre-made panels and attached the bottom panel first to the top of the frame. We use gyrock (dry wall) screws through the panel then into the temporary bulkheads. There is a problem screwing into the edge grain of MDF as it will split, some times pre-drilling is required. The screws are removed when the panel edges have been bogged. Alignment of the panels and bogging the joints. We use a combination of nylon cable ties and soft steel strapping to align the panels. Bog is applied between the strapping or cable ties and after they have been removed the joint is touched up with more bog. The steel strapping is available from builder's suppy shops and is pre-punched with holes. It is used for bracing house frames. Cable ties removed from stem and adhesive applied. Using clamps and straight board (timber or steel) the panels were aligned while the adhesive cures. The inside of the panels must be ground at the inside of the stem before assembly. The adhesive to consist of resin, aerosil (cabosil) and cotton fibres. Chines and stem bogged and radiused using a long board (plywood board about 600mm x 150mm covered with 80 grit sand paper). The area to be taped or covered with glass must be ground using 60-80 grit disc in an angle grinder. Chines and stem covered with double bias fibreglass. 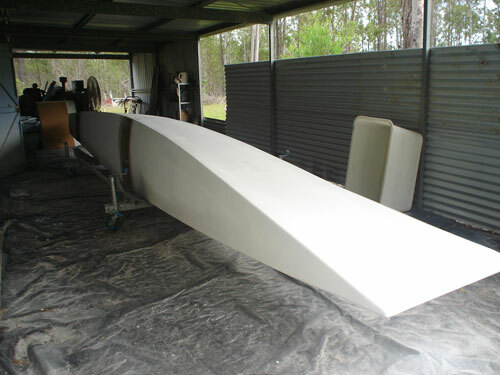 The double bias covers the entire bottom and bilge panels and extends about 65mm onto the side panel. The float was lifted off the building frame and the other float constructed the same way. First float right way up ready for the innards, second float progressing. Inside of joints taped, stringers glassed in and bulkhead locations ground ready for installation. We use a �wet fillet� method when taping joints. The area to be taped was sanded and coated with resin. The mixture for the fillet is aerosil/cabosil and cotton fibres mixed to a paste with resin. The fillet is formed with a filleting tool that has a radius similar to that of a compacting roller. Pre-wetted tape is applied over the fillet and compacted. Bulkheads and deck beams glassed in (taped). We use a laser leveller to set the hull up so the bulkheads are vertical. The beam support bulkheads must be double taped. This is easy to do by pre-wetting the tapes, rolling them up together and then placing them in the hull at the bulkhead/hull joint and unrolling over the wet fillet. The tape is then compacted carefully ensuring that there are no air bubbles. This method produces a very strong joint and the fillet does not need to be cleaned up and sanded before the tape is applied. Inside detail at the chain plate for back stay. A foam doubler is laminated to the side. Foam in the doubler and the side panel is removed with a 30mm dia. hole saw, back fill with very strong thickened resin (aerosil and cotton fibre) and glassed over on the inside. A threaded aluminium or stainless steel plate is fixed to the doubler with Sikaflex. Detail of "anti oil canning brace" between the stringers, location shown on the plans. Extra strips of foam sandwch glued to the sides to make a channel for the adhesive bonding the deck to the hull. The channel runs the entire inside perimeter of the deck and is repeated at the deck beams. The deck beams have the foam removed to a depth of about 10-15mm. The horizontal brace below the deck beam is to prevent "oil-canning" of the sides between the bulkheads. The glue used is a mixture of resin, aerosil/cabosil and cotton fibres. The deck installed in three separate lengths to allow for the beam installation. 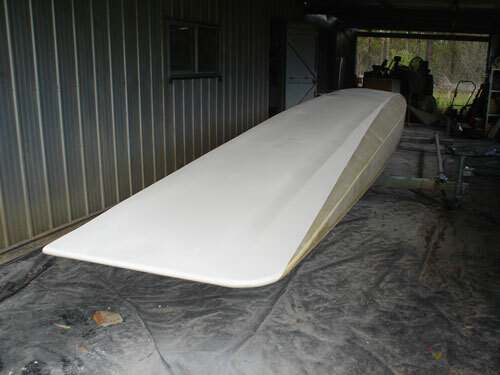 The decks on this prototype have a layer of unidirectional fibreglass on the under surface in addition to the standard lamination. This was done to eliminate any deck stringers and seems to work well as designed. The deck panel was made using the uni on the underside first with the main fibres running fore and aft. no glass on top at this stage. The panel was lifted onto the hull and temporarily fixed at the edges. The curved panel was then glassed on the top surface locking the curve inplace. Panel was then removed and the standard lamination applied over the uni. We now have a nice pre-curved deck panel that doesn't require stringers. The foam blank was laminated on one side with unidirectional cloth with the main fibres running longitudinally. This became the underside of the deck. The blank with the uni on the underside was attached temporarily to a non permanent gunwhale. I used scrap 25mm strips of foam and glass screwed to the side of the float at the sheer line. The blank was then bent over the bulkheads and screwed to the temporary gunwhale. The blank was about 15mm larger all around than the final required shape. The top lamination of glass was added to the blank and when cured the blank together with the temp gunwhale removed. Because the screw heads were now covered with glass I used a holesaw with the centre drill removed to cut the glass and foam to remove the temp gunwhale. The deck blank now has a permanent camber which will correspond to the deck beams and bulkheads. Another layer of glass was laminated over the uni directional on the underside and presto, a cambered deck panel without the need for stringers. This panel was glued down to the beams, bulkheads and sheer (they all had an extra thickness of foam and glass added) and held around the edge with soft steel straps until the glue cured. The straps removed, edge routered (to round off the edge) and then the edge taped. When all this was complete we moved the two floats outside and covered them up with tarps. The deck edge was radiused with a router and glass taped to the sides. CAUTION - When using a router on foam sandwich panels make sure you wear googles to protect your eyes and a long sleeve shirt as nasty bits of glass fly in all directions at great speed.